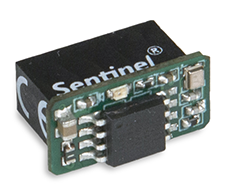 PROMOTIC hardware key (further "HW Key") serves for the protection of the PROMOTIC system and for the protection of the designer's "know how". There is burnt the complete information about purchased license in this key. The HW Key is the most commonly used license carrier. Each PROMOTIC HW Key is labeled by 4-digits number that identifies the license number. This number can be found on the white label that is attached on the HW Key. The information regarding the connected key can be obtained in the runtime mode by the Pm.LicenceInfo method, or in the INFO system of running application - /SYSTEM/License page. USB key: of the standard size is plugged in the USB port of the PC. 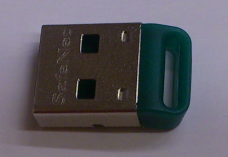 USB key: of the minimal size is plugged in the USB port of the PC. WARNING - this key type is functional since version PROMOTIC Pm8.2.16 and PROMOTIC Pm8.3.17. USB key: connected to USB port on PC motherboard. WARNING - this key type is functional since version PROMOTIC Pm8.3.8. - Development licence key. It is supplied together with the PROMOTIC development environment (at a price of the PmDev license) Without the development licence key the PROMOTIC development environment runs in the PmFree regime. - Runtime licence key. It is used as a PROMOTIC runtime license carrier. With the runtime licence key the PROMOTIC system is always launched into the application runtime mode. With such key the application can be edited or modified only if the key contains the licence PmDevForRt (since version PROMOTIC 7.3.0). Other licenses can be added into the runtime HW Key anytime. This can be done either by "overburning" the HW Key (i.e. the key has to be conveyed) or by sending the file (e.g. by an email) with the content of new license, see License file SWK extending the content of license key. - Problem connected with running the PROMOTIC application on OS Windows servers and virtual machines. - In the terminal service client process (remote desktop) it is not possible to access the HW Key driver. The reason is insufficient permision of the logged-in client for computer hardware access. This also concerns the driver that is used for HW Key access. The PROMOTIC system cannot be installed in this mode. The following overview indicates the compatibility of PROMOTIC version with OS Windows version. Installation of HW Key drivers is a part of PROMOTIC system installation. This way the application can accesss the content of the HW Key via the driver. There may be problems in situation when an older PROMOTIC version is installed on a new OS Windows that was not known at the time the PROMOTIC version was released. - Abort the current installation by closing the error window. - Download installation package of current driver Driver HASP and follow the installation steps indicated in the manual. The version of installed driver can be identified by running the HW Key driver installer with the -info parameter. For example: c:\Pm\hinstall -info. Running the installer of HW Key driver with -? parameter, for example: c:\Pm\hinstall -? will indicate the version of the driver that is contained in such installer.